In December of 2015, fans of the Star Wars saga bore witness to the release of director J. J. Abrams’ Episode VII: The Force Awakens, a brilliant return to form which served to reinvigorate the franchise and wash away more than a decade’s worth of bitter disappointment garnered by the ill-fated Prequel Trilogy. It served to remind us all of the reasons we were enamored with the story of this faraway galaxy in the first place. The hero’s journey. Epic, sweeping stories of good and evil, light and dark, drama and tension, but also humor and love, intriguing characters, powerful relationships. And of course spaceships and lightsabers. It was everything we wanted and more, and fans were elated. At least, for a time. Slowly but surely, concerns began to wallow in the hearts of fans of what this new trilogy might ultimately become. The reason The Force Awakens was able to so effectively pull at our heart (and nostalgia) strings was it’s rigid adherence to formula. While it was incredibly refreshing and heartwarming (and I would argue necessary) to see this return to form, it instilled a fear in the larger fanbase that this was all the long-awaited trilogy would amount to: formulaic fan service. Thankfully, however, director Rian Johnson has taken Episode VIII: The Last Jedi as an opportunity to squash those fears and throw them out with the trash (otherwise known as the Prequel Trilogy). Johnson takes this trilogy and the saga as a whole in entirely new and excitingly unexpected directions. The plot is simple enough. The ragtag remnants of The Resistance fleet, helmed by the late Carrie Fisher as General Leia, are amidst a desperate attempt to escape the clutches of the unequivocally evil First Order. 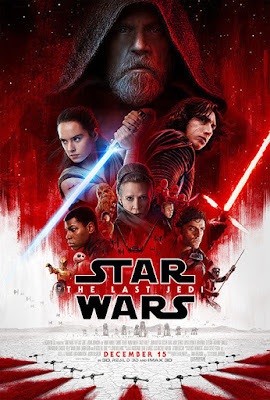 We pick up with our heroine Rey (Daisy Ridley) on a remote island on a remote planet in a remote star system trying to convince a disheveled and broken Jedi master Luke Skywalker (Mark Hamill) to overcome his grief and rejoin the fight for the galaxy. Supreme Leader Snoke (Andy Serkis) has evil plots in mind, not only for The Resistance, but also for his hotheaded, deeply conflicted apprentice Kylo Ren (Adam Driver). Of course, that’s not all there is to it, but that is the general idea. Old, treasured characters like R2D2 and Chewbacca get their moments, along with another whose appearance is so surprising and welcome that I don’t dare spoil it. Prominent characters from the previous film, namely Poe Dameron (Oscar Isaac) and Finn (John Boyega), return and are given proper, fulfilling levels of character growth. We’re also introduced to some new faces: Rose (Kelly Marie Tran), an unassuming yet brave maintenance worker, and Vice Admiral Holdo (Laura Dern), a serenely commanding leader in the Resistance. Is it a flawless film? Of course not, the greatest ones rarely are. There’s a subplot involving Finn, Rose, and a casino that, while I appreciate it’s narrative point of showcasing that, not every plan our heroes hatch is always going to end with their victory (again, our theme of failure), begins to overstay its welcome and is occasionally ham-handed in its delivery of social commentary. And while it is a major factor in spurring Poe down his character arc, Holdo keeping her plan of escape so close to the chest that she refuses to reveal even the slightest detail, grows weary after about the third time Poe gets smacked around and told to go to his room. I have a couple more gripes, namely a romance that feels sudden and unnecessary and a character’s use of the force that is simultaneously cathartic in its existence, yet awkward in its delivery. However, none of these issues do much to derail the film from delivering where it counts, subverting our expectations in a purposeful way, pushing the saga to leap forward from the restraints of the past. The Force Awakens reminded us all of why we fell in love with Star Wars to begin with; The Last Jedi lets us know that there is so much more waiting to be explored in that galaxy far, far away. Star Wars: The Last Jedi is currently playing at Dinuba Platinum Theatres 6. Showtimes can be found on their website. Platinum Theaters Dinuba 6 now proudly presents digital quality films in 2-D and 3-D with 5.1 Dolby digital surround sound to maximize your movie experience. Joseph Ham is 22 years old and a frequent participant in local theatre, both on and off stage, and Reedley's River City Theatre Company is where he makes his theatre home. He's currently working as a VAPA Tech for KCUSD.